why’s google earth gone blurry? 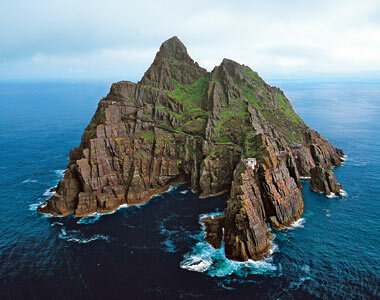 i want to take an aerial tour of skellig michael, a rock in the atlantic that has caught our imagination lately. the pictures i can find of it only show the one side, and i want to see the other one. in fact, i want to fly all around the island at an altitude of 100 feet. maybe 300. and land on the top peak. but it’s gone all blurry on google earth. 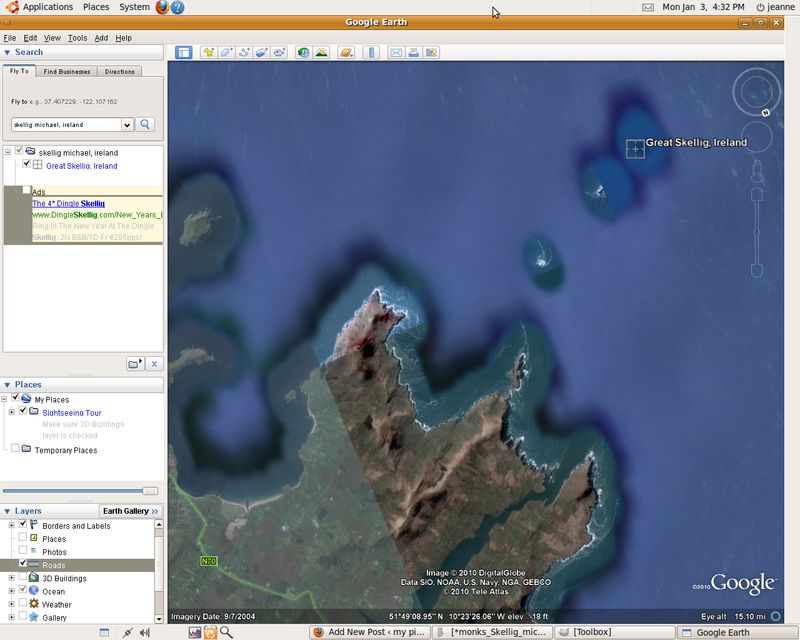 and it’s recent, too, because here’s a site referencing a closeup of the island using google earth. so it’s been blurred out. if you zoom down and fly around it, the shape of it’s there, in dark blue, a hulking shadow on the horizon from sea level. but there’s nothing there to look at, just grayed out blue. it’s not a weapons site, or a site of any strategic importance at all. it is, however, a unesco heritage site, and as such really should be explorable. but someone (i hate conspiracies) has stepped in and removed the ability to go close up to skellig michael, which you can’t get to most days because of the rough waves. and this pisses me off. there’s nothing about it in any discussion groups, and my email to google maps has only just now been sent. but it’s not like it’s somebody’s back yard and they don’t want the world looking down on their shoulder. there’s nobody living there, for pete’s sake. jim says it’s because the island is a secret dragon lair. he saw it in a vision and is working up a painting now. 5/11. something wonderful. 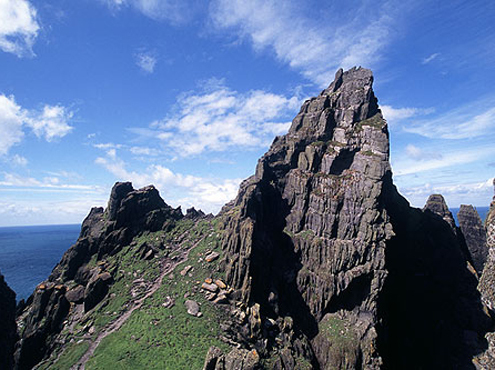 i can see the skelligs now. here, lookie. you can even do a fly-around by it. 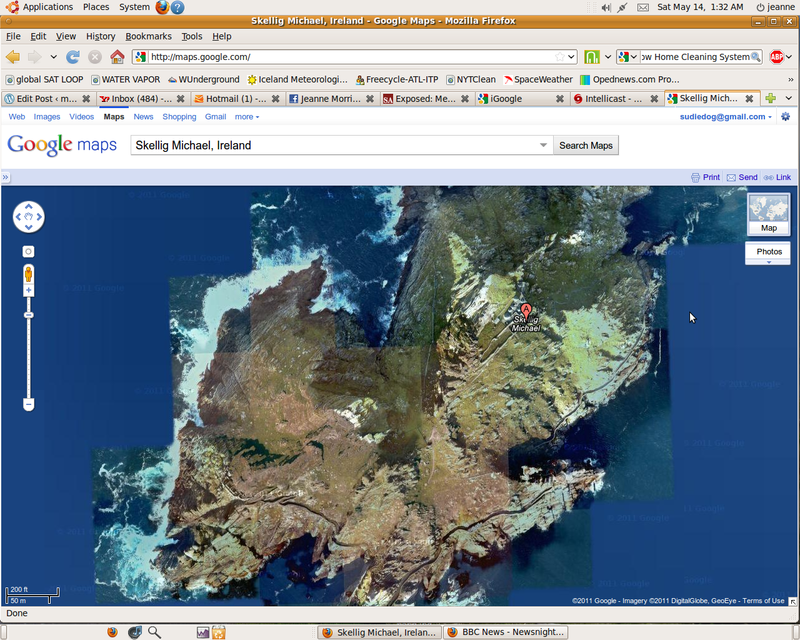 Posted on January 3, 2011, in research and tagged google earth, skellig michael. Bookmark the permalink. Leave a comment.